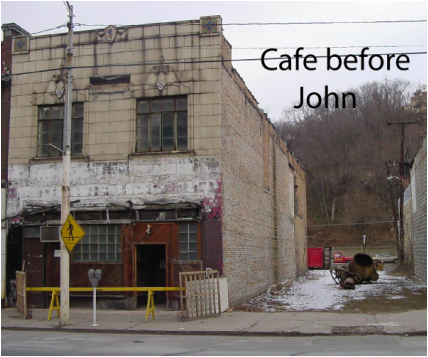 When Church Army officer John Stanley arranged in 2001 for the purchase of an old store front on Franklin Avenue in Aliquippa, he expected he and other volunteers would have a working coffee shop ministry in six months, tops. Then part of the building literally fell off. Nearly four years of volunteer labor followed, but the results are impressive. Now, a fully functional café and coffee shop stands in what used to just be another run-down building. Of course, Uncommon Grounds isn’t really about just serving a good latte or even paying its bills (something Stanley never expects it to be able to do). It aspires to help a whole community heal and lead individuals to Jesus. “We’re here to change Aliquippa,” said Stanley. Sometimes that means connecting someone down on their luck with the proper social services, or just listening. In other moments, there may be opportunities for evangelism and guiding people to local churches. But doing all those things is going to take volunteer labor a bit different than that required to refurbish the building. Stanley is currently in the process of recruiting what he hopes will be a team of 60 workers willing to make coffee, cook sandwiches and connect with patrons. He’s hoping Episcopal churches that supported Uncommon Grounds during the refurbishment phase, such as Church of the Ascension in Oakland, Prince of Peace in Hopewell, Church of the Savior in Ambridge, Fox Chapel, and St. Stephen’s in Sewickley, will be joined by others all over the Diocese as well other congregations of many denominations from all over the Aliquippa area in sending volunteers and making use of the café. Besides providing coffee and conversation, Uncommon Grounds also acts as the home for a Fresh Expression of church, hosts Bible studies, features music on it stage and art on its walls. Uncommon Grounds also has hosted a number of church youth events and other activities. With the café complete, the coffee on and visitors flowing through the doors day after day, Stanley is excited to see what God has planned for Uncommon Grounds. He is especially happy to see the broad cross section of people who are visiting. “Everyone, from the wealthy to the very poor, is stopping in. Part of my understanding of a healthy community is that it’s diverse,” he said. In the winter of 2013, after 14 years of growth in Aliquippa, John Stanley felt the call to return to his earthly homeland. With much prayer and with the help of a search committee, John brought on Herb Bailey as the Ministry Director to continue the work that the Lord has started and pray for continued opportunity for growth and love in the community. For more information about volunteering at Uncommon Grounds Cafe contact Herb Bailey at 724-375-6141. Open from 7 am to 5 pm Tuesday and Wednesday, and from 7 am to late in the evenings on Thursday and Friday, and 8 until 2 on Saturday. Uncommon Grounds is located at 380 Franklin Ave in downtown Aliquippa, Pennsylvania.